Chronic inflammation is known to drive many cancers, especially liver cancer. Researchers have long thought that's because inflammation directly affects cancer cells, stimulating their division and protecting them from cell death. But University of California San Diego School of Medicine researchers have now found that chronic liver inflammation also promotes cancer by suppressing immunosurveillance — a natural defense mechanism in which it's thought the immune system suppresses cancer development. The study is published November 8 in Nature. "Recent successes in cancer immunotherapy — in the form of immune checkpoint inhibitors and adoptive T cell transfer — demonstrate how activated immune cells can eradicate tumors, but until now we didn't fully appreciate immunosurveillance or the role of adaptive immunity in tumor formation," said senior author Michael Karin, PhD, Distinguished Professor of Pharmacology and Pathology at UC San Diego School of Medicine. "This study provides one of the strongest and most direct demonstrations that adaptive immunity actively prevents liver cancer." Karin led the study with first author Shabnam Shalapour, PhD, an assistant professor in his group. The team used a new mouse model of liver cancer in this study. Rather than artificially triggering cancer by engineering genetic mutations, this model more closely mimics human liver cancer in that tumors develop as a natural consequence of non-alcoholic steatohepatitis (NASH), a chronic metabolic disorder that causes liver damage, fibrosis and numerous cell mutations. NASH is associated with obesity and is expected to soon become the leading cause of liver cancer in the U.S. and other Western countries, Karin said. The researchers found that NASH-associated mutations provoke the immune system, including cytotoxic T cells, to recognize and attack the newly emerging cancer cells. However, chronic liver inflammation in both mice and humans also led to the accumulation of immunosuppressive lymphocytes, a type of immune cell Karin and Shalapour first described two years ago. In the battle between these two types of immune cells, immunosuppressive lymphocytes win — they use a molecule known as PD-L1 to interfere with cytotoxic T cells. 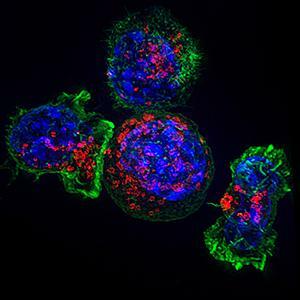 With the brake on T cells, liver tumors formed and grew in the chronically inflamed mice. In mice that lacked tumor-fighting cytotoxic T cells, 27 percent of 15 mice had large liver tumors at six months. At that same point, mice retaining cytotoxic T cells had no tumors. Similarly, mice without immunosuppressive lymphocytes hardly had any tumors, even at 11 months, presumably since their absence left the cytotoxic T cells alone to do their tumor-fighting job. "PD-L1 allows immunosuppressive lymphocytes to suppress cytotoxic T cells, but it's also their 'Achilles heel,'" said Karin, who is also the Ben and Wanda Hildyard Chair for Mitochondrial and Metabolic Diseases. When the researchers inhibited PD-L1 with a drug or by genetic engineering, immunosuppressive plasmocytes were eliminated from the liver, cytotoxic T cells were re-invigorated and they cleared the tumors. "These findings provide an explanation for the remarkable ability of so-called anti-PD-1 drugs, which block the receptor for PD-L1, to induce liver cancer regression," Karin said. "The first member of this class of drugs was recently approved for the treatment of advanced liver cancer." Karin, Shalapour and team are now working out how immunosuppressive lymphocyte are recruited to the liver. That information may reveal a way to interfere with the recruitment or generation of these cells, which could provide new means for liver cancer prevention or early treatment. Liver cancer is the second leading cause of cancer deaths worldwide. Liver cancer is caused by chronic liver inflammation driven by hepatitis B or C, alcohol consumption, non-alcoholic fatty liver disease (NAFLD), or NASH. Currently, the only available treatment is surgical removal or ablation of tumors. Study co-authors also include Ingmar N. Bastian, Alexander A. Aksenov, Alison F. Vrbanac, Weihua Li, Andres Perkins, Zhenyu Zhong, Debanjan Dhar, Jose A. Navas-Molina, Jun Xu, Rohit Loomba, Pieter C. Dorrestein, Rob Knight, Christopher Benner, UC San Diego; Xue-Jia Lin, UC San Diego and Jinan University; John Brain, Quentin M. Anstee, Newcastle University; Alastair D. Burt, University of Adelaide; Takaji Matsutani, Repertoire Genesis Incorporation; Michael Downes, Ruth T. Yu, Ronald M. Evans, Salk Institute for Biological Studies. This research was funded, in part, by the National Institutes of Health (R01AI043477), Superfund Research Program (P42ES010337), European Union's Horizon2020 Framework Program, Newcastle NIHR Biomedical Research Centre, UC San Diego Center for Microbiome Innovation, Irvington-CRI, PCF Young Investigator Award, SCRC, ALF Liver Scholar Award.